I’ve done Whole30 twice now, and it’s worked both times. I lost weight, and felt better in so many ways. But here’s the thing – it’s not practical. Both times after I stopped Whole30 I went back to my old eating habits. Sure it took a few weeks, but it happened. I made some healthier choices overall, like eating more veggies and drinking more water, but I still ate crap way too often. And I realized, I can’t just keep doing Whole 30 every 3 months and thinking it’s going to stick. What’s that definition about insanity? So I’m here to share with you the new plan that Husband and I developed and are starting together this week. We love Whole30 aka Paleo and how it makes us feel. However, we know it’s not practical to eat healthy 100% of the time, yet don’t have enough self control to say “we’ll eat paleo majority of the time” without any specific guidelines. I remember my friend Samantha telling me (via her friend Jillian Michaels) you should use the 80/20 rule for eating healthy – 80% healthy, 20% not. If there are 21 available meals to eat in a week that means 4 of those can be cheat meals. These are numbers I can work with. That sounds totally doable, right? That means I could eat 1 cheat meal Friday, Saturday and Sunday and still have 1 left over to use during the week. I don’t feel restricted like I can never eat pizza or ice cream again, but I have guardrails in place. We also set up a few other rules – unhealthy snacks or desserts count as 1/2 a meal; if you don’t use ANY of your cheat meals for the week you get to spend $X (still undecided) on something you want, like new clothes, shoes, etc. What do you think? The hope is that this will help us turn healthy eating into a lifestyle instead of just a fad or a diet. Have any other tips or ideas to share? I’ll keep you updated on how it goes! Okay, technically this time it’s Whole20: Jan. 4 – Jan. 23. 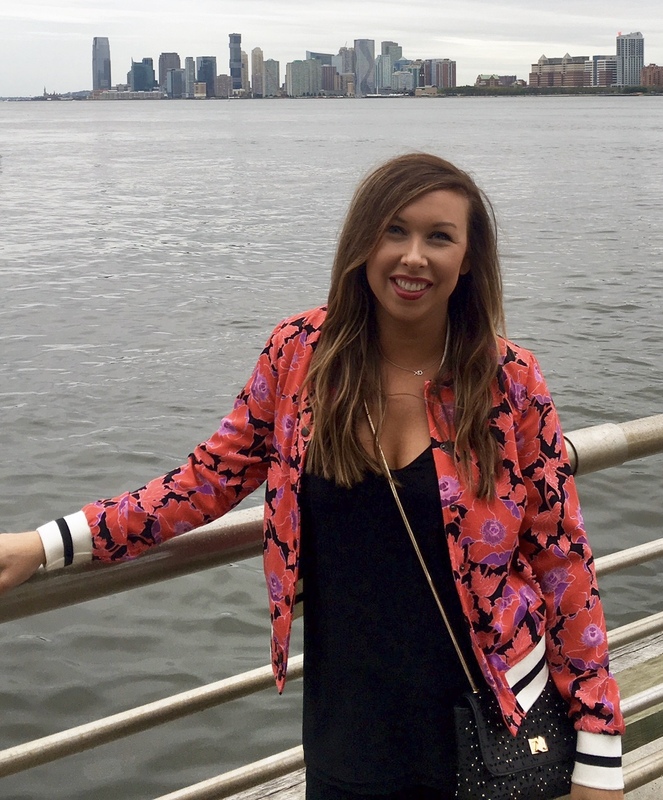 I went back and read my blog posts from my last Whole30 and remembered how amazing I felt while I was doing it. As I said in one post, I was a walking infomercial about clean eating – my cravings diminished, I slept better, I had more energy, I lost weight, etc. etc. So, here we are again. 1 trip to Europe, 2 fattening holidays, and countless cocktails later, I need a cleanse. Meat, veggies, fruit, water, coffee. No grains, no sugars, no dairy, no alcohol. I’m currently on Day 4 and feeling good. I’m not joking when I say I’ve already seen and felt a difference in my body and weight. But instead I will drink my Pellegrino and remind myself, nothing tastes as good as skinny feels. Week 3 was far and above easier than week 2, when I felt like I was constantly craving things I couldn’t have. I still want things (like gooey-cheesy-goodness macaroni and cheese from The Tavern, thanks to a friend’s picture on Instagram…), but I’m not obsessing over it or thinking about it as much as I was a week ago. Yeah I still want a cappuccino some mornings, but I’m very content with my black coffee. Yeah I still want some chocolate after dinner, but I’m very content with eating some fruit instead if I’m still hungry. My relationship with food has changed dramatically. I use to think about every meal almost obsessively and about how I could make it as delicious as possible with cheese and butter and sister schubert’s rolls and more cheese. But now, I’m just thinking about what to eat that will fill me up and give me good nutritional value. Of course I still want it to taste good, but dinner doesn’t have to be phenomenal every single night. I think that will make those cheat days even better, right? (I can’t say because I haven’t had one in 3 weeks, but that’s what I’m thinking…) But it’s not like we’re eating bad food. Last week I shared a recipe we both loved, tonight we’re making steaks, and check out husband’s breakfast from yesterday! It was pretty damn delicious (and healthy!). I’ve really learned a lot about myself and my body, and I’ve learned to say no. My willpower has shocked the heck out of me. I honestly didn’t know I had it in me. This is our final week of Whole30; however, we’ll be changing what we eat quite a bit even after the 30 days. I’ll share more about that in next week’s recap. Typical New Year’s Resolution: Go on a diet. Lose Weight. I’ve started making small changes in my diet. The biggest one being no more diet cokes every day. I’m not saying no more diet cokes forever, because I think having one every now and then is fine (like with mexican food – yummm) but definitely not one every day. I’ve only had 2 in the last month and I’m feeling just fine. Granted, I am drinking more coffee now because I still haven’t crossed that no caffeine hurdle BUT I’ve started drinking black coffee – no milk, no sugar, just black. Without those coke chemicals like aspartame, I already feel better about what I’m putting in my body – water and coffee. The food is harder. Figuring out what to eat 3 times a day is hard enough, but then trying to make it healthy?? Ugh. I honestly have no clue what I’m going to do when I have kids. Feeding two is enough. Lately though I’ve been inspired to eat healthier (and easier) with make-ahead meals. 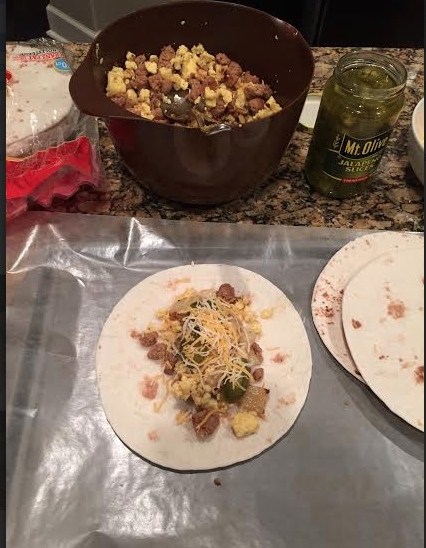 I have been vowing for months to make these make-ahead breakfast burritos via momadvice.com. 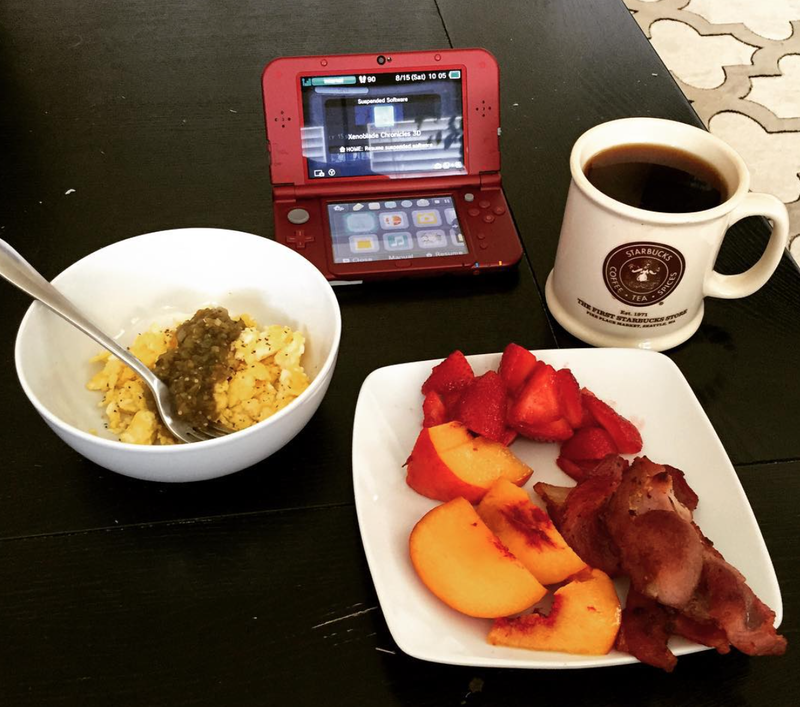 Husband and I are not good at eating a solid breakfast. I typically just grab a Kind bar and maybe some fruit, maaaybe, if I eat anything at all. He sometimes eats yogurt. Then by lunch I’m so hungry I’m ready to eat anything and everything in my path. Not a good start to the day. I needed something quick to grab, filling and fairly healthy. I’m not an egg eater at all (hard boiled eggs make me want to vomit), but when mixed with a bunch of different flavors (specifically mexican flavors, like huevos rancheros) I like them enough. I know they’re a good source of protein so I found this recipe great for breakfast. We’ve already gone through two rounds of these in just a few weeks. They’ve become our staple breakfast or sometimes lunch, and they are delicious. You can also change them up however you like! 1 lb Italian Turkey Sausage — if you haven’t tried this, it’s what totally makes the recipe! To roast potatoes, preheat your oven to 475 degrees. 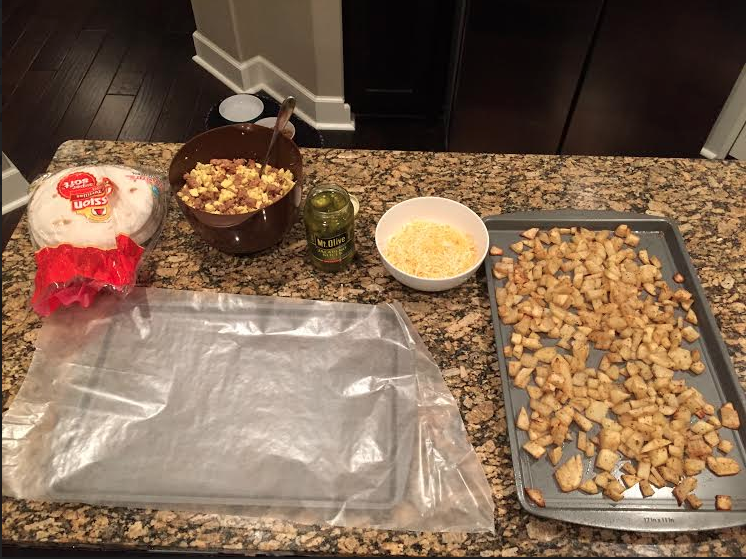 Drizzle diced potatoes with oil and season with salt, pepper, paprika, and garlic powder. Toss the potatoes together to evenly coat in oil and seasonings, and spread out into a single layer on the parchment. Roast until browned on the bottom and tender, about 20-25 minutes. Brown your sausage. Once it is cooked through, set aside in a large bowl. Make an assembly line – tortilla, cheese, followed by a small handful of potatoes and a scoop of the egg/sausage mixture. Roll the tortilla up. For reheating, place a frozen burrito in microwave for 35 seconds on each side. I had been seeing this trend for a while now and thought it looked amazing, but it wasn’t until a friend posted on Instagram pictures of her salads for the week that I decided I had to try it. It is SO simple and so customizable. There are literally thousands of ideas for different salads on Pinterest. I decided to make mine with no meat, but you could easily add in canned chicken if you wanted. 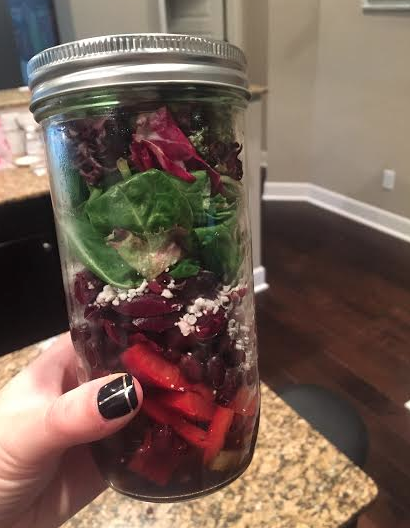 What’s so great about the salads is that the dressing is in the mason jar. 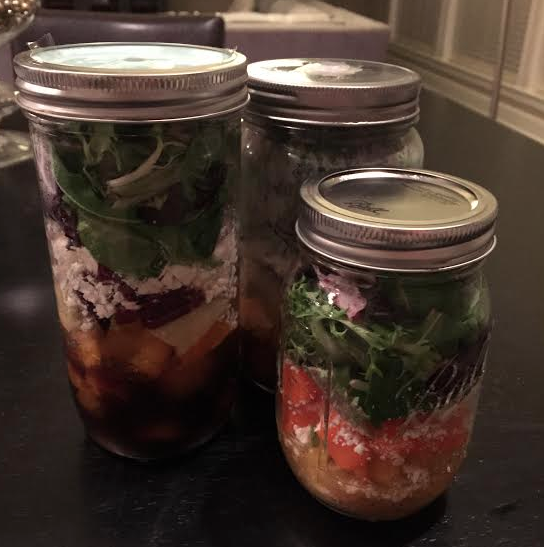 You don’t have to have a separate container for dressing. You just grab the jar and go. Start with the dressing of your choice. Add the hard veggies that you don’t mine getting soaked, like tomatoes, peppers, carrots. Add the second layer of veggies or protein, like beans, cucumbers, artichokes, olives. Add the meat here if you want. Add the cheese, I like feta or a little gorgonzola. Add the lettuce, my preference is spring mix. 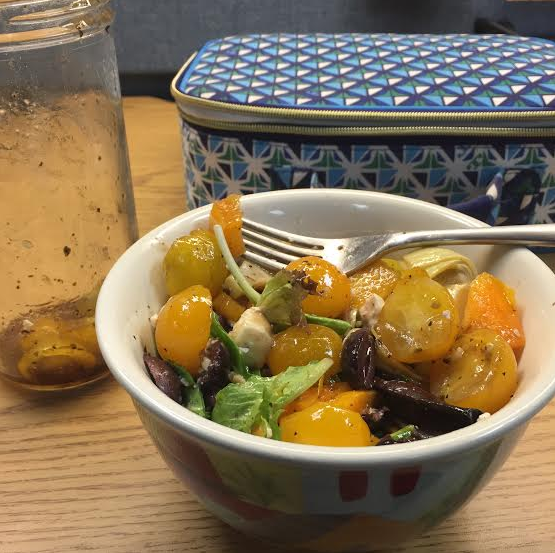 I keep a bowl and fork at my desk at work, so then all I have to do is pour it out, mix it up a little and it’s a great lunch full of veggies! Thank you. You were not what I was anticipating tonight, and that’s a good thing. I had some doubts after my first time with you. It was hot, oh so hot, sweaty, crowded, difficult. Then I left you and it was even hotter outside. I swore I’d never come back to you again. I just couldn’t possibly understand why someone would want to drown in their own sweat, while standing so close to someone else that they could also feel droplets of their sweat on them too. You disgusted me. But then I decided to give you another chance. Your followers really are your best asset, as they can be very persuasive with their stories about how much they love you. Guess what – this time you were different. First of all, it was cold outside, very cold. And the room wasn’t crowded, and it was peaceful, and you didn’t make me do as much cardio as before. I thought, okay, I can do this. Then we got going and I felt like I might die. I thought, Oh, now I remember why I don’t do yoga. But through the pain and inner complaining, I realized something. This was the first time this week I hadn’t been focused on work or my personal problems. I was legitimately only focusing on my breathing, the poses and the present moment. For that alone, I thank you. 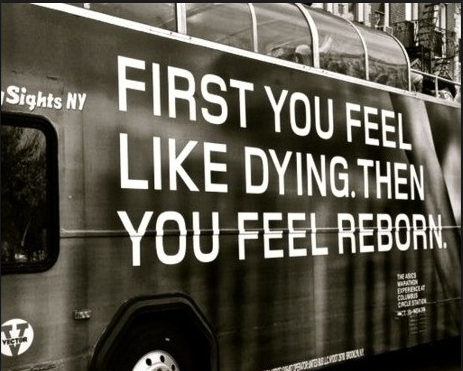 First you feel like dying, then you feel reborn. And that’s exactly how I felt by the end of it. Reborn into a new day with new strength and new peace. Somehow you won me over tonight. So again, thank you. Okay friends, I’m going to be honest with you. I’m kind of a workout flake. I’m all talk, no action. Wait, let me correct that – I’m all talk, no action lots of action for about a week, maybe two, sometimes a month if we’re lucky. Well, husband is sick of me complaining about my body and is forcing me to take action. (Isn’t that what husbands are for??) I’ve been so proud of him working out consistently the past few months so I decided to take a similar course of action. We both downloaded the iPhone app Touchfit: GSP. I’ve only done two days so far, but I love it. It’s quick, but challenging. It tracks your progress in real-time. It never gets dull with more than 500 videos. It tailors the workout for your fitness level. And it’s on your phone so you can literally work out whenever, wherever. So it begins again, and I just pray I can stay committed.